The era of the $35 cup of coffee has come to an end, for most. Unless a consumer chooses to opt-in for overdraft protection, their ATM and debit purchases will be declined if an account has insufficient funds. Prior to Sunday, banks could automatically enroll their customers in the service, which covers the point-of-sale transaction but can result in steep penalties. Shoppers at the counter might turn red with embarrassment when their purchase is refused, but the alternative is for their account to go further into the red -- with fees up to $35 for each swipe of the card. When added to the cost of a 99-cent taco, $35.99 doesn't exactly fit on the value menu. Just last week, a federal judge accused Wells Fargo of "profiteering" by employing overdraft policies that led customers to pay multiple fees. The bank was ordered to return $203 million to its customers. 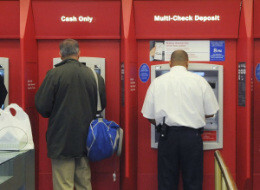 However, Wells Fargo intends to appeal and several other banks have indicated that they will not change their policy of processing the day's largest transactions first (as opposed to chronological order), which increases the likelihood of multiple small transactions incurring overdraft fees. But if customers don't have overdraft protection anymore, the banks can't collect. In July, the National Foundation for Credit Counseling did an online survey (PDF) which found that 26% of their 2,089 respondents planned to opt-in for the protection. Pad your checking account by carrying a balance that you will not likely exceed. Most people spend a similar amount each month. If possible, keep an extra100 in your checking account to cover unplanned expenses. Get help managing your finances. Reach out to an NFCC Member Agency by going online to www.DebtAdvice.org, or to be automatically connected to the Agency closest to you, call (800) 388-2227. For assistance in Spanish dial (800) 682-9832. CNN Money took a look at whether the protection could be useful for consumers, and also has some ideas on how to avoid problems with overdrafts and fees.